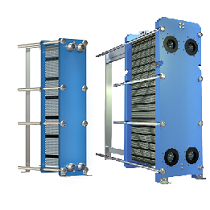 The heat exchangers of the Longtherm series can be adapted to almost any requirement profile. They are available in a wide range of sizes, embossments and connection types, offering the best compromise between low flow resistance and highly efficient heat exchange. This allows Longtherm heat exchangers to cover all major energy applications. Use our new design tool to quickly select the right heat exchanger. The special brazing process ensures the stability and permanent connection of the plates, allowing the heat exchangers to easily withstand high temperatures of up to 230 °C and, depending on the type, permissible operating pressures of up to 30 bar. 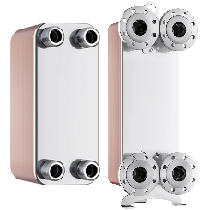 Due to their efficiency, gasketed heat exchangers are used for very low temperature spreads and very high output ranges over 1MW. Thanks to their dismantlability, the heat exchangers can be cleaned quickly and easily. Additionally you are now able to vary the amount of plates used in your product.